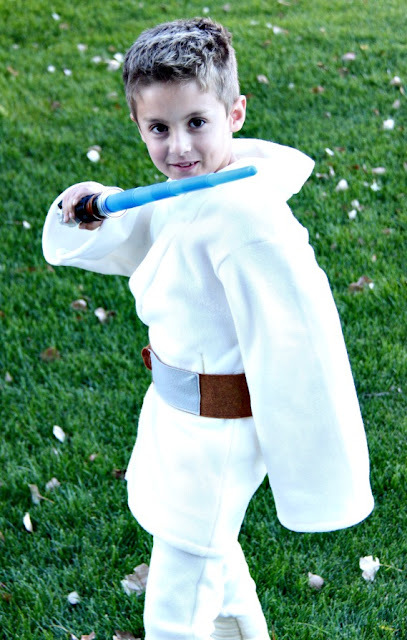 This young Jedi in training wishes you a very Happy Halloween. This was the costume I was finishing yesterday exactly 45 minutes before our Halloween party. Okay most the time I am delusional. My mental stability aside, it got done and I super love how Luke turned out. Again, I sewed everything but the accessories out of a lightweight fleece. Now if you ask my machine if the fleece was lightweight, it would probably "Hurmph" at me. My machine definitely did not like sewing all this fleece. 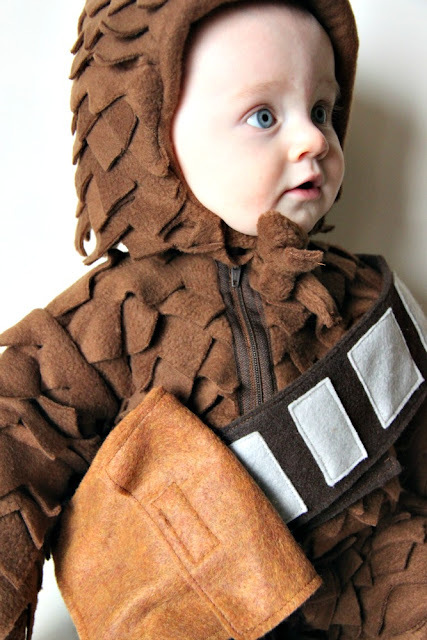 Tiny Chewbacca probably broke my machines will right off the bat. Skywalker's faux boots also seriously strained my machine. I am really happy though with how that part turned out. We seem to always be making costumes that require boots. I have made shoe covers before and they always get trashed. So for the last several costumes I made the bottom of the pants look like the top of the boots. Then the boys just wear regular shoes. 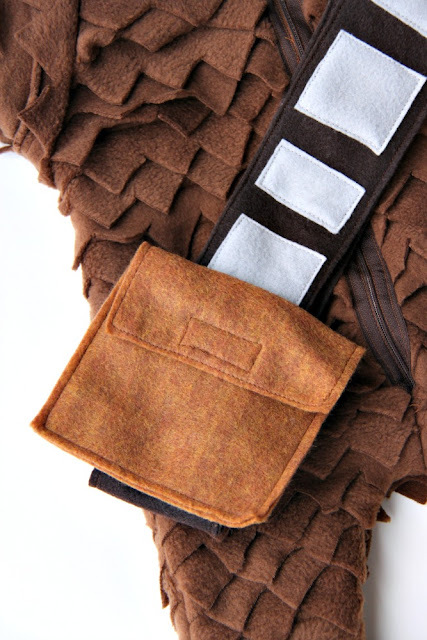 To make Luke's faux boots I sewed on individual strips of felt onto the bottom of the pants. I layered them a little like mummy wrapping. I totally think that they look similar to Luke's boots. 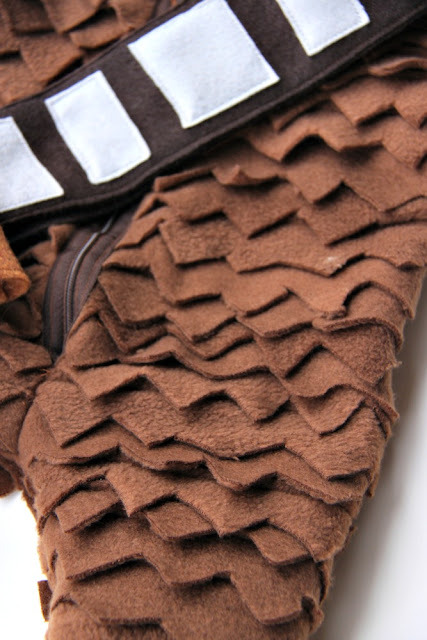 Unfortunately all of those felt strips being attached to my "lightweight" fleece made for slow and tedious sewing. My machine and I were fighting by the end. Thank heavens, she hung in there and all the costumes got done. There was a minute or two where I had the very real fear they wouldn't. Luckily Oldest was able to be a Jedi and didn't have to squeeze into his Wolverine costume from last year. Not a huge Star Wars buff, but even I know Wolverine doesn't really seem to fit in. 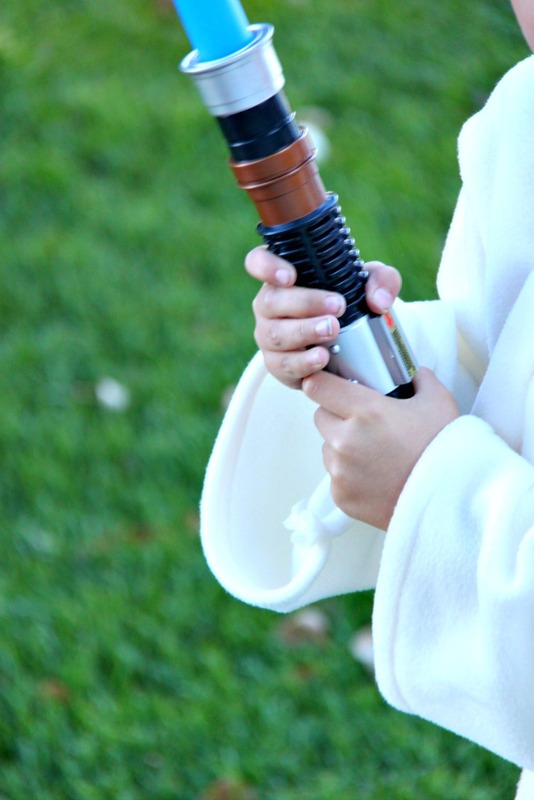 We almost didn't have a light saber either. I had plans to make some...I still might try my idea some day. However, time, um kind of, um got away from me. 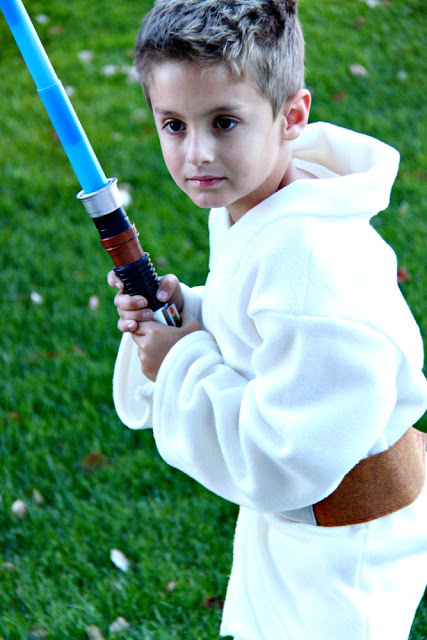 So yesterday morning I was running around town looking for a light saber. Luckily it only took a couple of stores. 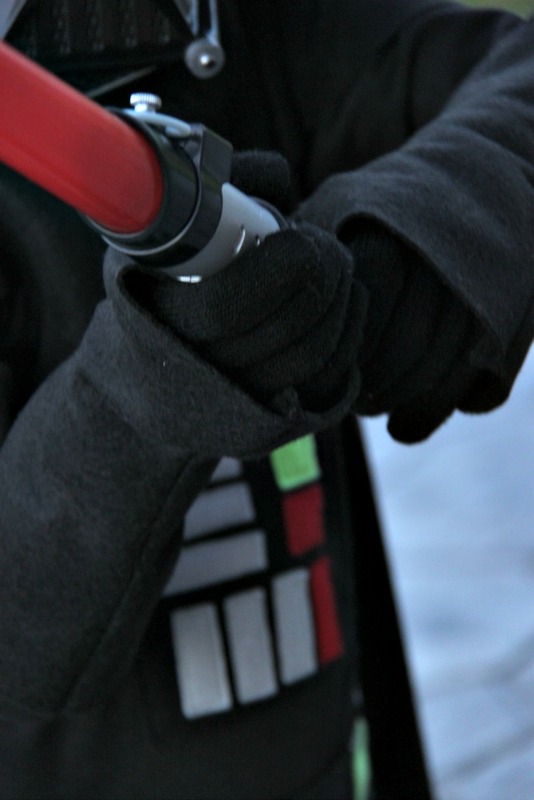 Luke wouldn't be Luke without one. 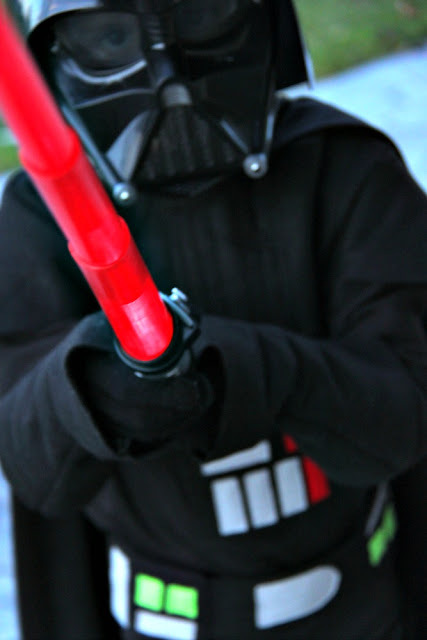 I even made a belt out of felt with a loop to attach his light saber too. He looked pretty legit. Finishing the Luke Skywalker costume rounded out our Star Wars Halloween of 2012. 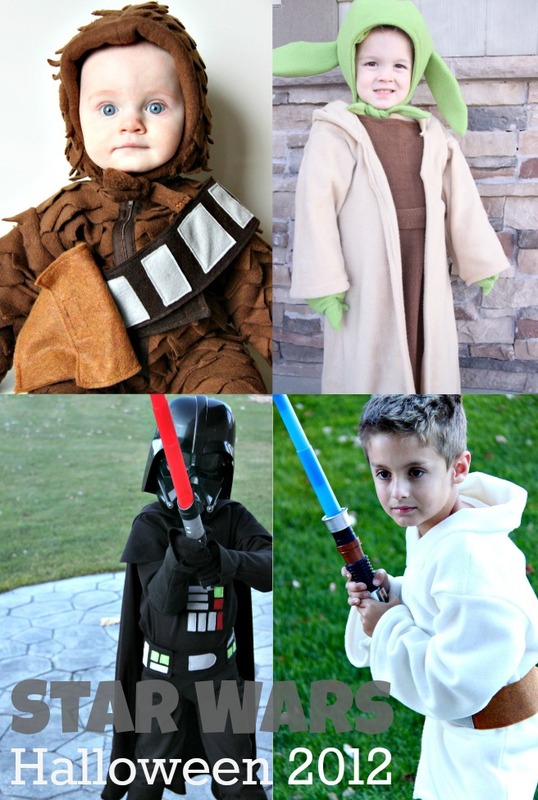 I am not sure which costume is my favorite. Which one do you like best? If you can choose that is...hahaha. I got one picture of them all together. It was rouuuuughfff. Hence the not-so-perfect shot. Still I thought it would be fun to see them all together. So grateful to be the Momma to these Little Men. Looking forward to our little Halloween. Happy Halloween to all of you. Be safe and have fun. A day for tricking. A day for treating. 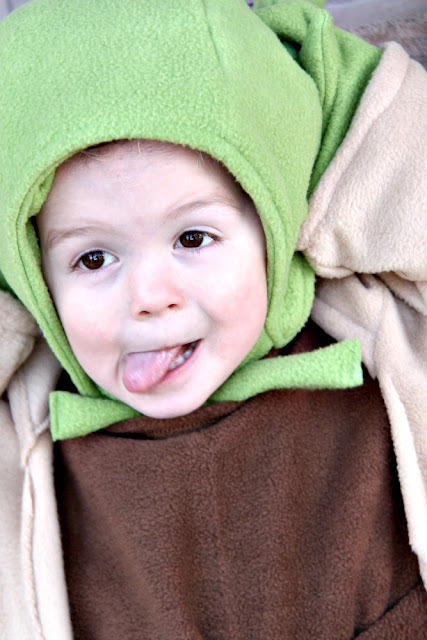 A day to dress up and gather obscene amounts of candy. A day to pilfer candy off your children. Hmm...yum. I can already taste those fun size snicker bars. A day to kick up your feet and shout "Hallelujah!". A day when the costumes are actually done and ready to use. I finished my last costume literally 45 minutes before we had a church Halloween party last night. Forty-five minutes people! With all that sewing and pulling out of my hair, it didn't leave much time for photo taking. However, I dragged my little Darth Vader outside so I could snap a couple of pictures of his dark side cuteness. He is quite intimidating is he not? There will probably be another post today. 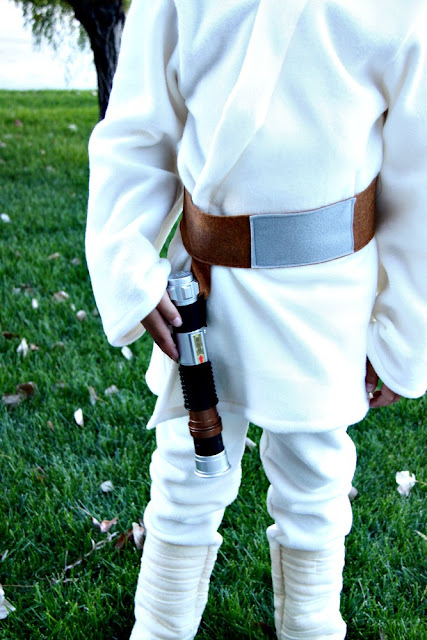 After all, we have a very important Jedi to introduce you to. 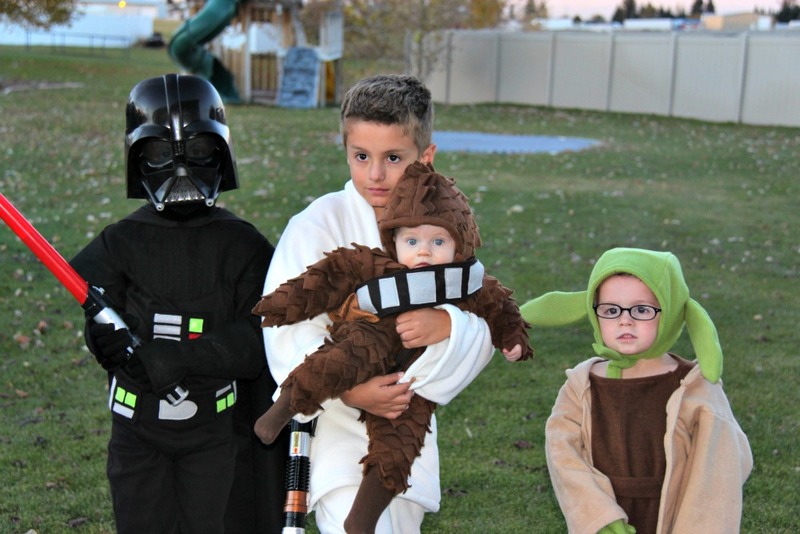 That will round out my little Star Wars crew. 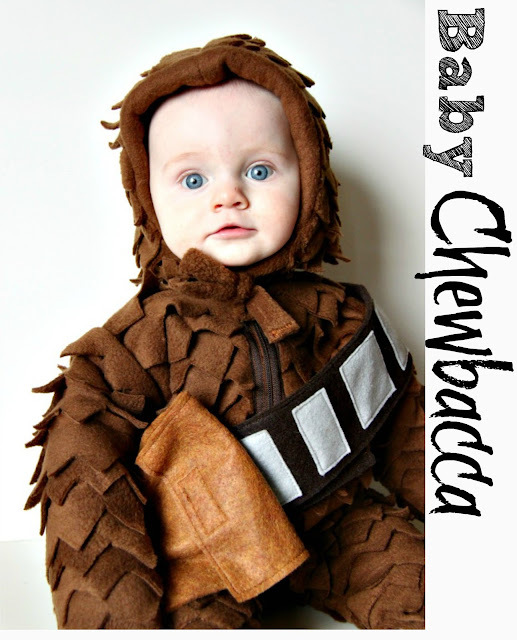 He is all ready to join his brother Baby Chewbacca and go trick-or-treating. 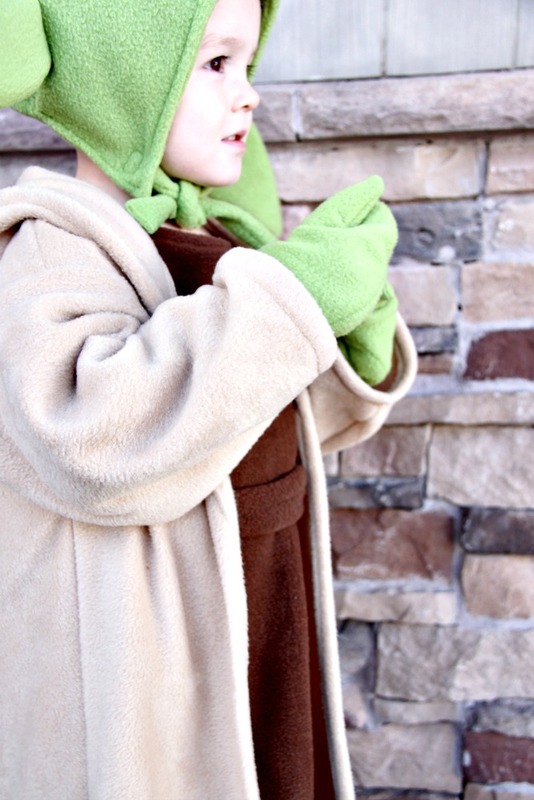 His entire costume is made from fleece. Good thing since we have recently had a snow storm. 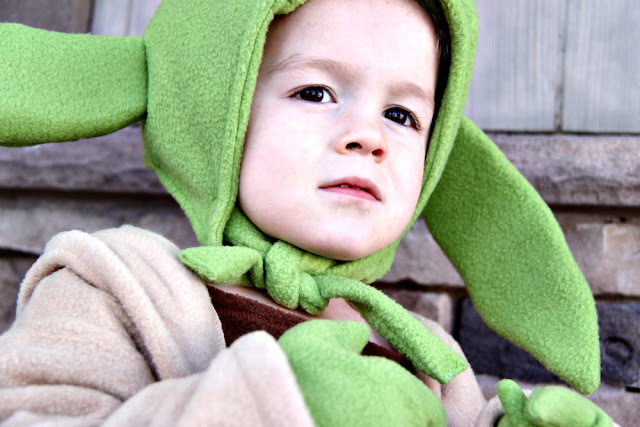 My favorite part of his costume is the little Yoda hood. 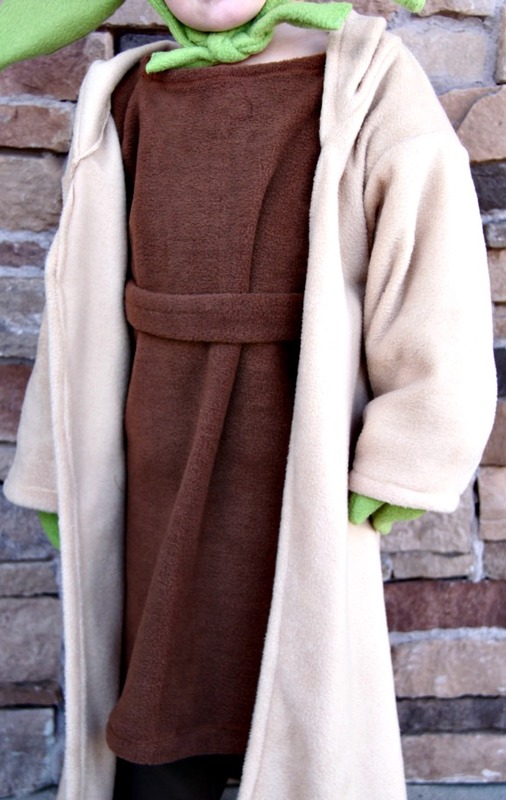 The robe is pretty cute and cozy too. 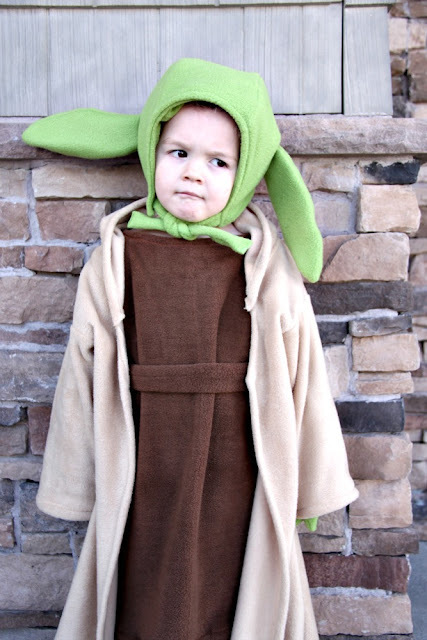 Who knew Yoda had a silly side? 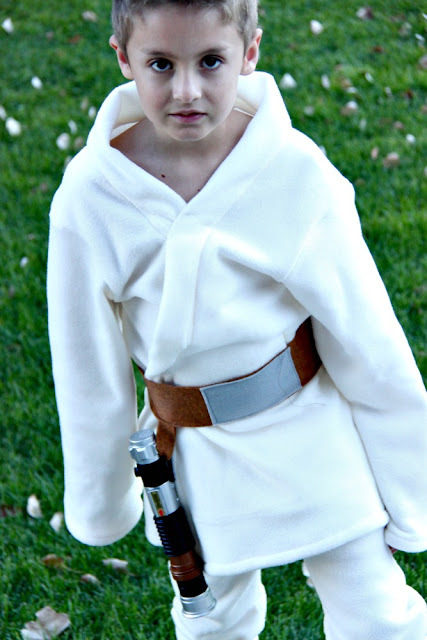 I have two days to get two costumes done...May the force be with me. I am gonna need it. At approximately 4:30 in the a.m. on Thursday morning, I was walking through the house. What!?! That would be the truth. Yup folks, my super cute baby still gets up in the a.m. to inhale a feeding. So I was up in the a.m and noticed that it was unusually bright outside, especially for an early Fall morning. I was super puzzled then a light bulb went off. Immediately in my head I groaned, "Noooooooo!" I opened the blinds and sure 'nuff, the ground was covered in white stuff. Hahaha, I totally just rhymed. While I was a little sad at the immediate ending to Fall, my most favorite season, I was excited for my Little Men. They LOVE, luuhve the snow. 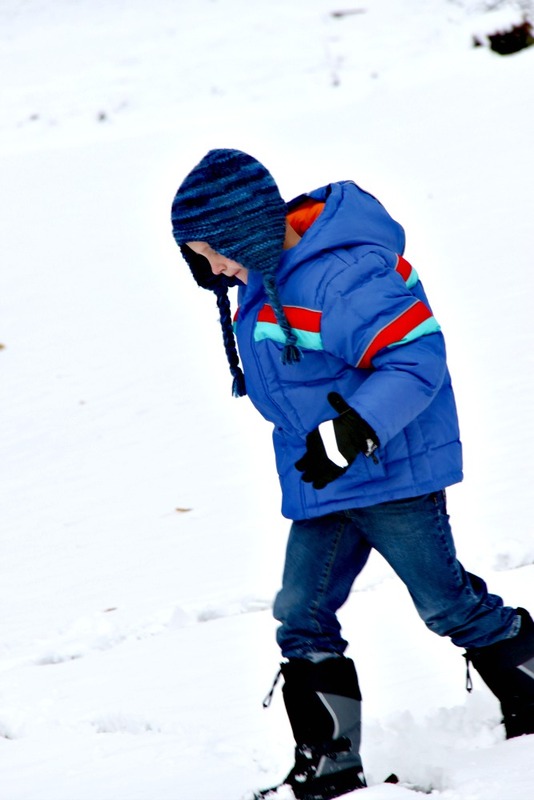 When they came upstairs to get ready for school and saw that I had set out snow boots, they immediately ran to the window. Thanks to the snow we had one of our chipperest mornings ever. They got ready in speed time and happily walked out the door. 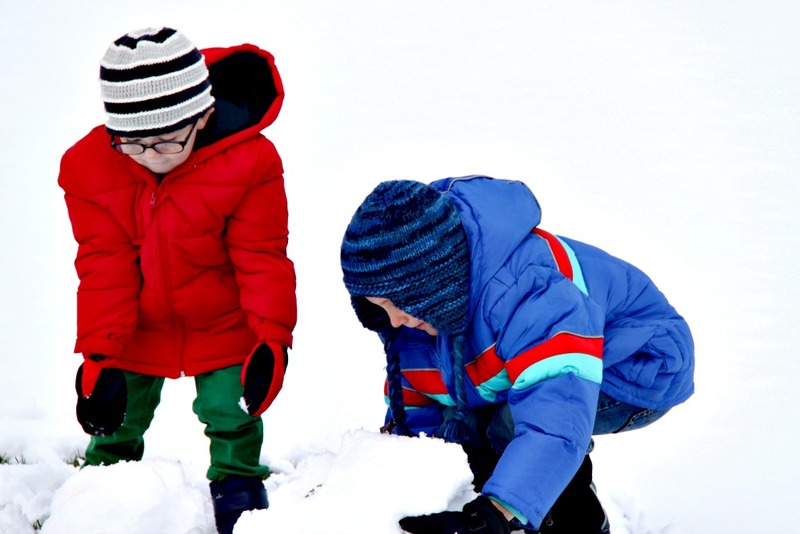 By the time Middle and Little came home from school, they were both all to happy to head back outside and have some fun in the snow. They made smaller snowballs. 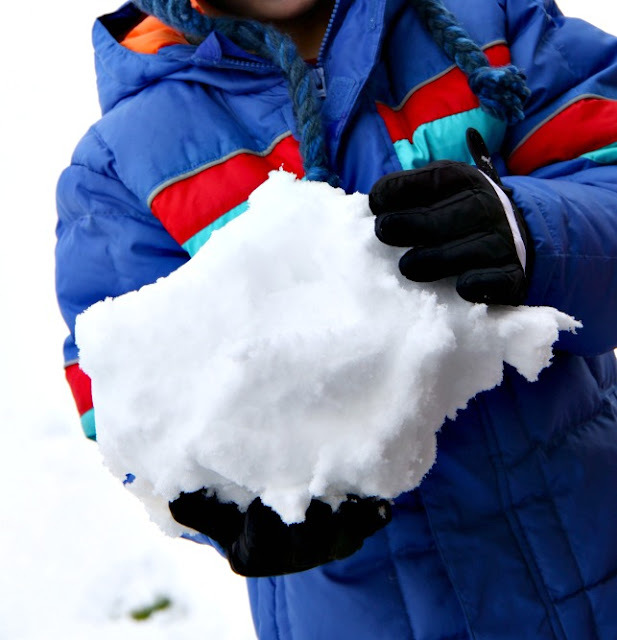 Middle may also have been caught putting those small snowballs in the hood of Little's coat. 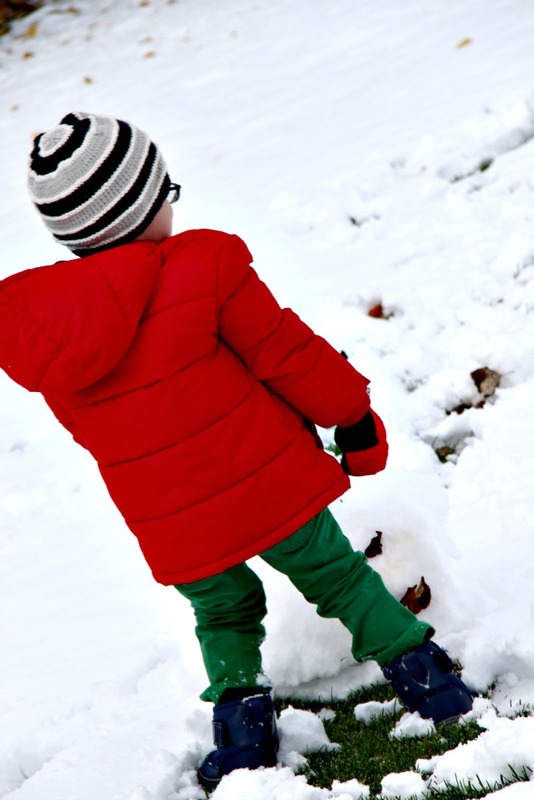 There was lots of snow throwing and lots of stomping around. There was lot sand lots of happiness. 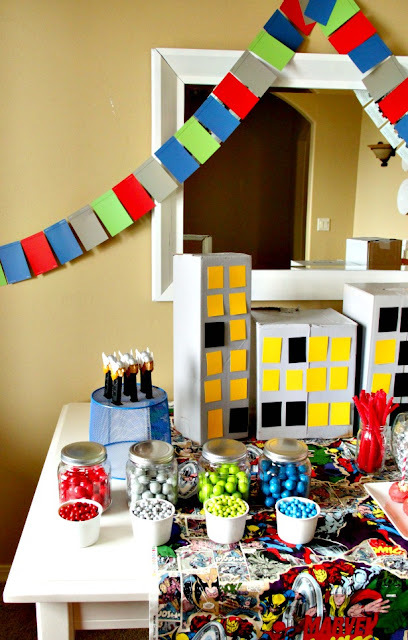 The other big thing this week was getting ready for Middle's 6th birthday. This was my first birthday party since becoming a Momma to four Little Men. I will admit it was really rather tough to pull off. There were plenty of moments were I just wanted to scrap it all and buy some pizzas and let them all play video games. Since I had promised Middle an Avengers party, and because that made him super duper excited, I stuck with the whole shindig. We had tons of fun and I think the party was a success. Here is a sneak peak for now. 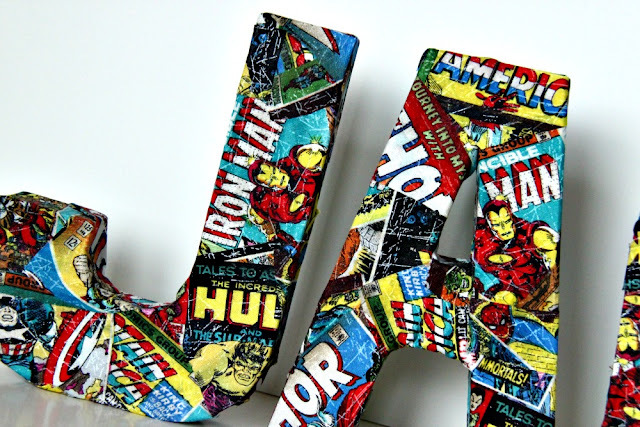 I will post about all our Avenger fun next week. Have a happy and lovely Sunday. Every time I go to the grocery store I seem to feel it necessary to grab another can of pumpkin puree. I have an obsession. Pumpkin madness, if you will. Since I have been rather fond of canned pumpkin lately, it would only seem to reason that I am also rather fond of baking with that very canned goodness. I have already shared the yummiest Pumpkin Bread recipe this season. 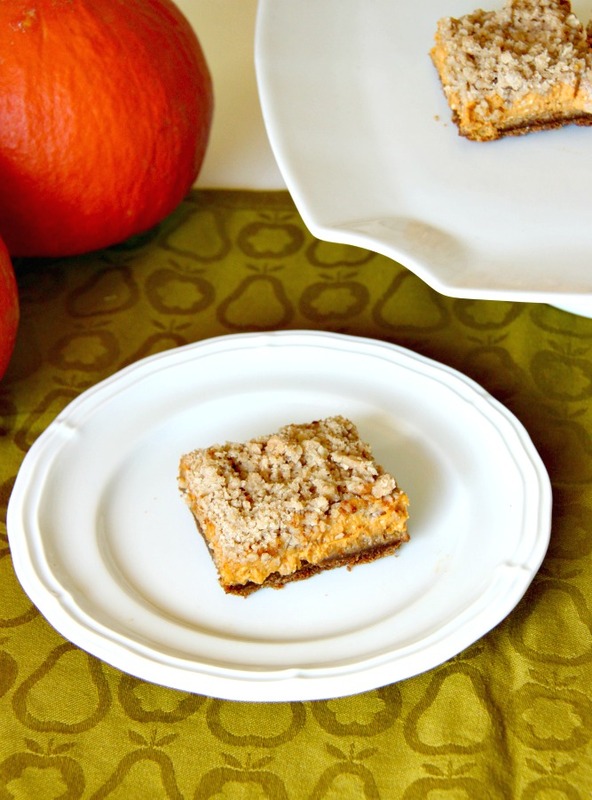 I have shared a Gingersnap Pumpkin Cheesecake Bar recipe too. 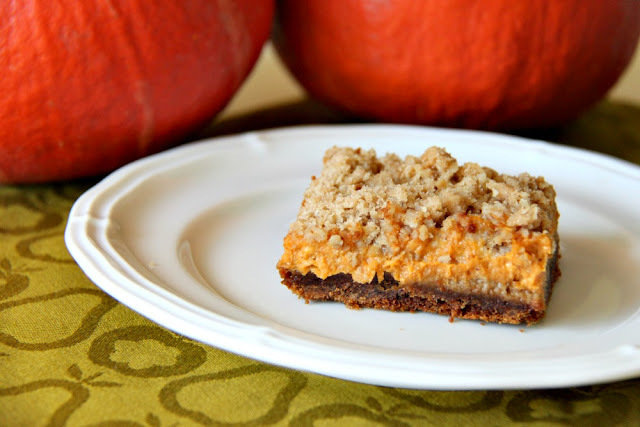 In years past, I have also shared recipes for Pumpkin Patch Cookies and for Pumpkin Pie Bars. So clearly, I like baking with pumpkin...well that is except for actual pumpkin pie. We have talked about this before. I find pumpkin pie mayhaps a tad bit yucky. I seem to be making up for my pumpkin pie aversion by baking everything else pumpkin flavored. 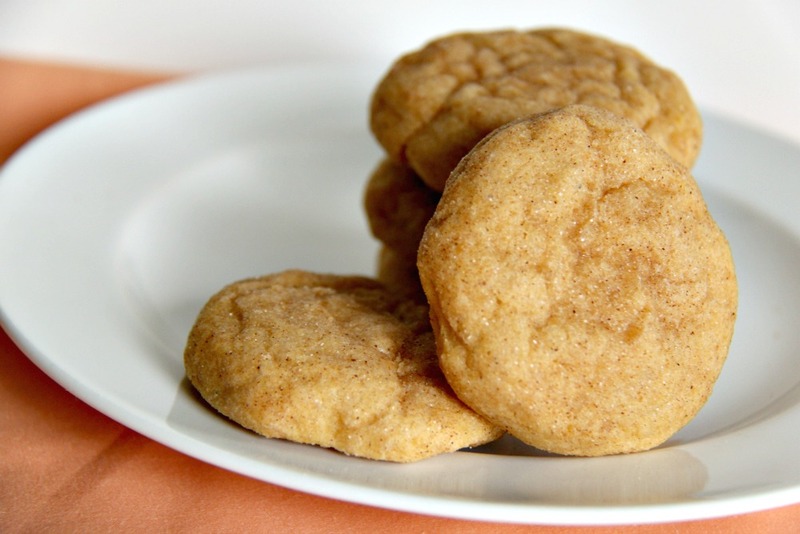 Everything you love about a snickerdoodle meets everything you love about pumpkin desserts. 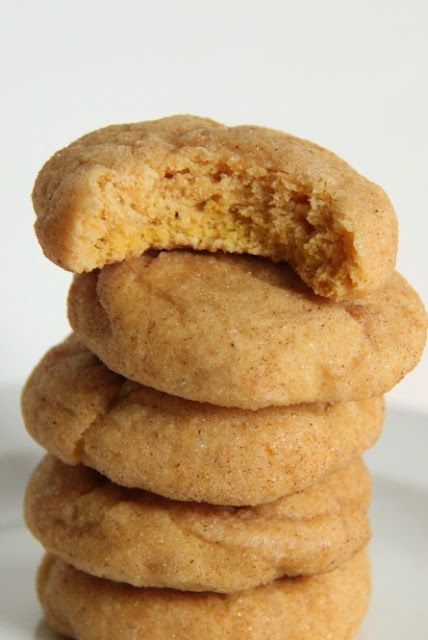 Basically, you have a pumpkin sugar cookie rolled in a sugar/pumpkin pie spice mixture. Next time I make these cookies it will have to be for the intent of sharing with the neighbors. That way I will only eat four-ish. It might be obvious, but I highly, highly recommend eating making this cookie. Combine the flour, baking powder, salt, cinnamon, and nutmeg in a bowl and set aside. In the bowl of a mixer, cream the butter and the sugars until fluffy. Blend in pumpkin. Then add in the egg and vanilla until well combined. Slowly mix in dry ingredients until just combined. Cover the dough and chill for at least an hour. Preheat the oven to 350. Combine the sugar and spices for the coating in a small bowl. Scoop the dough, about 2 TBS worth, and roll into a ball. Coat each ball in the sugar/spice mixture. Place on a cookie sheet about 2 inches apart. When the cookie sheet is full, dip the bottom of a glass with a small amount of water and then dip in the sugar spice mixture. Slightly flatten each cookie with the bottom of the glass, recoating the glass with the sugar mixture if necessary. Bake the cookies for 10-12 minutes, when just set and baked through. Let cool for 5 minutes before removing to a cooling rack. Let cool completely. Eat some. Then store the leftovers in an airtight container. 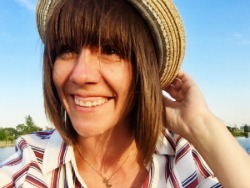 Welcome to another A Pinteresting Wednesday! 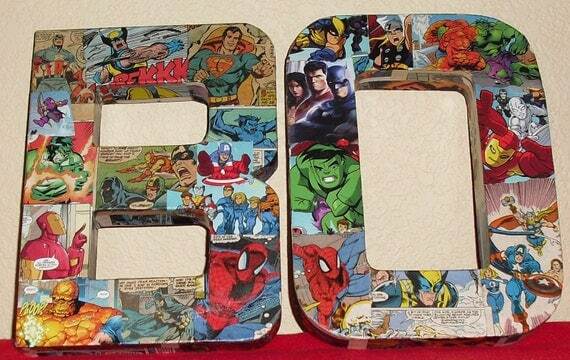 Then we are going to be getting our party on, Avengers style. My to-do list is about one third done, but a couple of late nights and we'll git er' done. 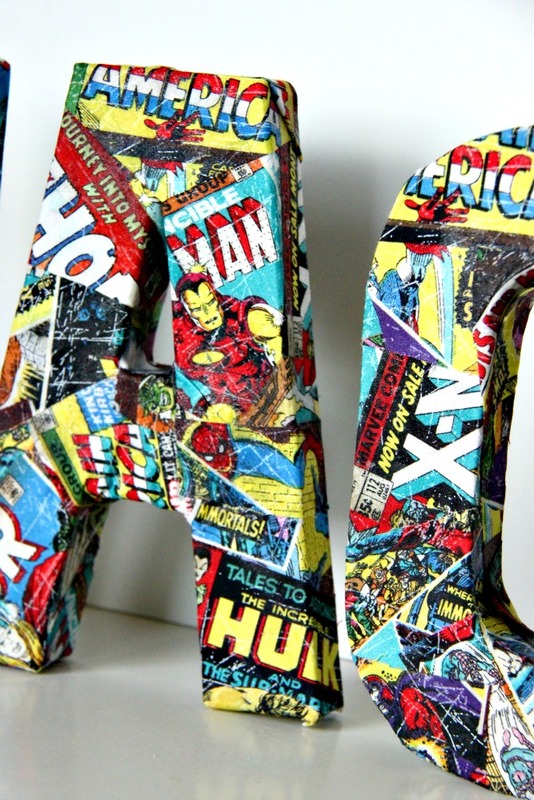 When I saw this etsy shop, I knew I wanted to add this idea to my Avengers Party Pinterest Board. 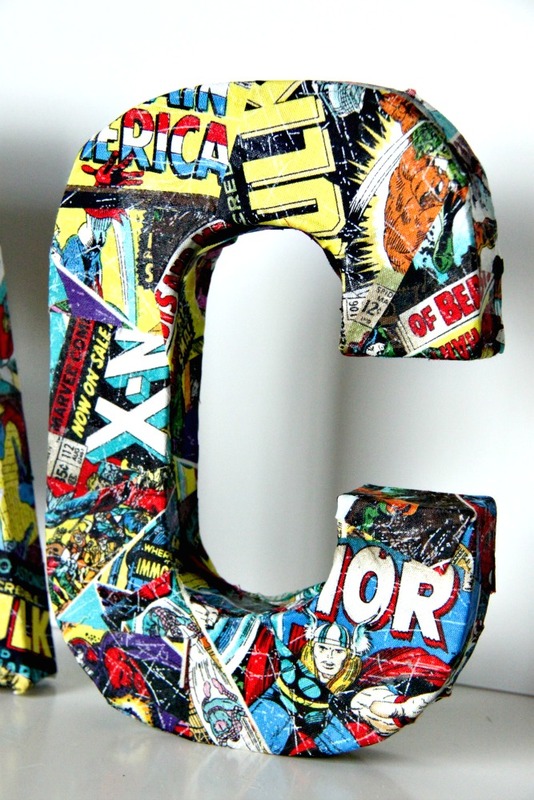 I loved the idea making letters decoupaged with comic book pages. However, it was quite a bit harder to find comic book pages than I had anticipated. 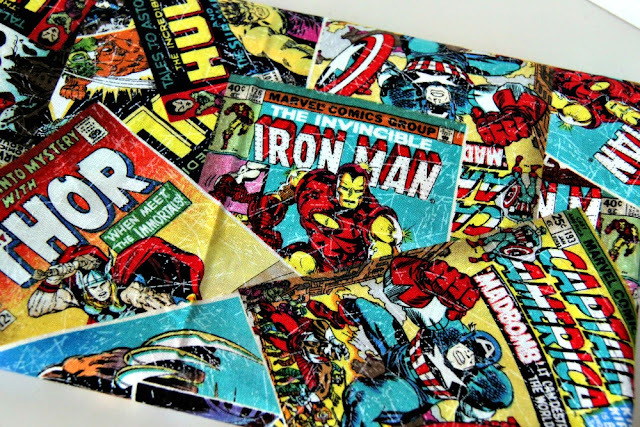 Short of buying new comic books, I realized using actual comic book pages might not be possible. With one last effort I decided to look at JoAnn Fabric. BAM! Found what I wanted. Fabric that looked like comic book pages. PLUS I am pretty sure I spent less money on the fabric than I would have on an actual comic. Love it when I save money. I loved how the letters turned out. Using some handy dandy Mod Podge, I glued on scraps of the material on to paper mache letters. I actually think that the fabric was easier to work with than paper. After the party, Middle is excited to use these letters in his room. I am freaking a little bit about how much more I still have to do to make this party happen, but what will be will be. 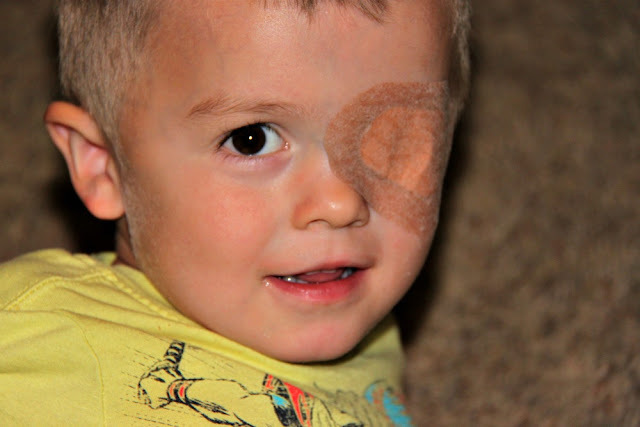 Now a little update on my sweet cross-eyed Little. 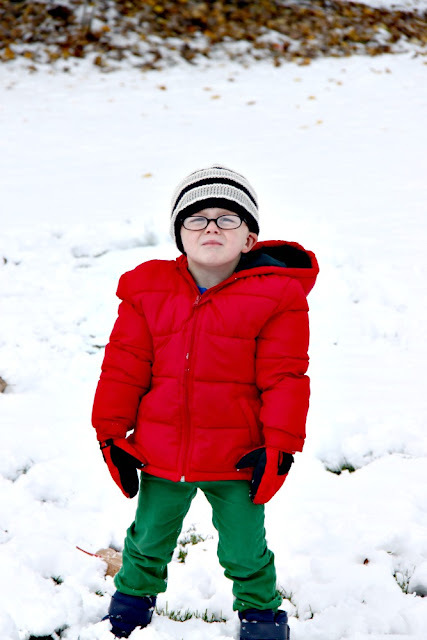 He is the cutest Smarty Pants ever. 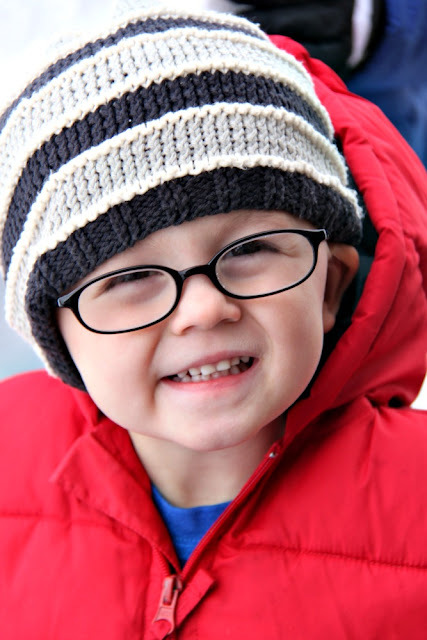 These new glasses will be a pretty permanent fixture in his life. For who knows how long he will have to wear these all day long. 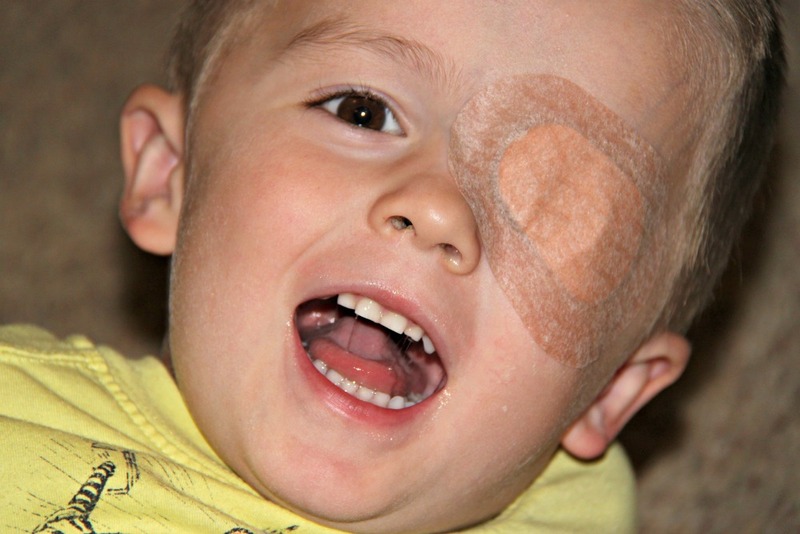 For two hours of those days he will also have to wear a patch over his good eye under the glasses. 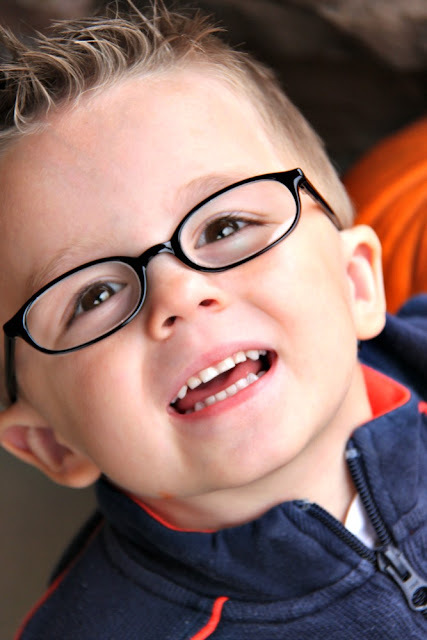 Wearing his itty bitty glasses I know will be hard for him, but I am sure soon enough they will be such a fixture that he probably won't even notice them. Thanks for all of your kind words and well wishes for Little in his new adventure. First...I just want to say thanks to all of you who left me comments and sent emails in response to our recent bleh week. It meant a lot to me that I could take some time, disappear and take care of my little family and that you guys would all be here when I got back. 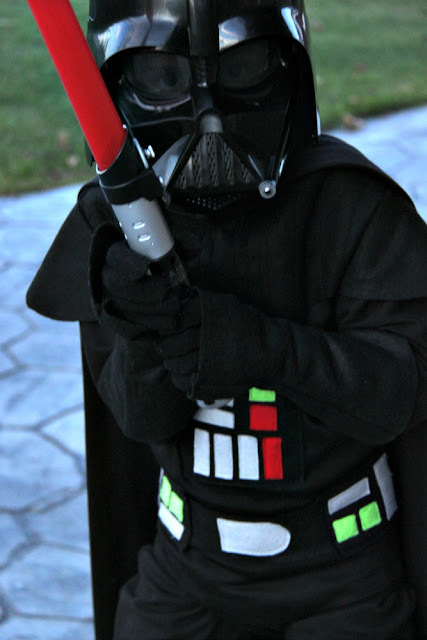 Hopefully now that we are all on the mend I can buckle down and finish all our Halloween and birthday funtastic tasks. I wanted to share with you our first family costume. The theme this year is Star Wars. 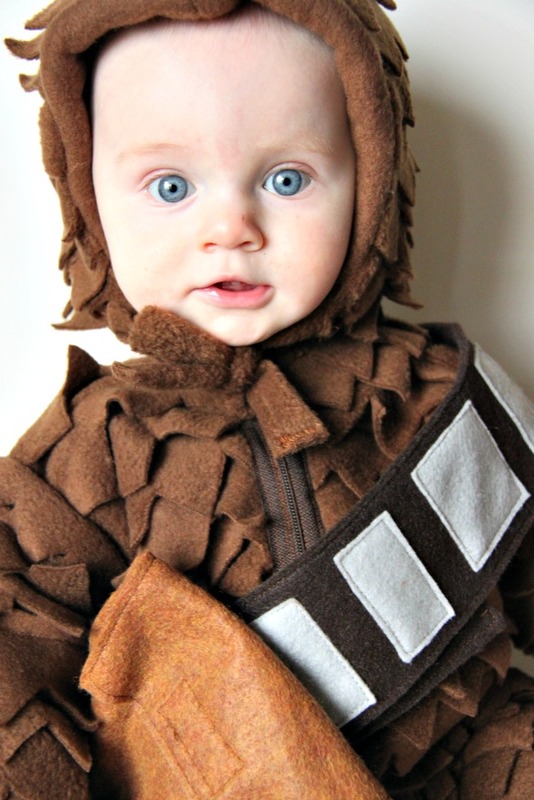 The teeniest tiniest costume in our family is this to die for...I mean TO.DIE.FOR. 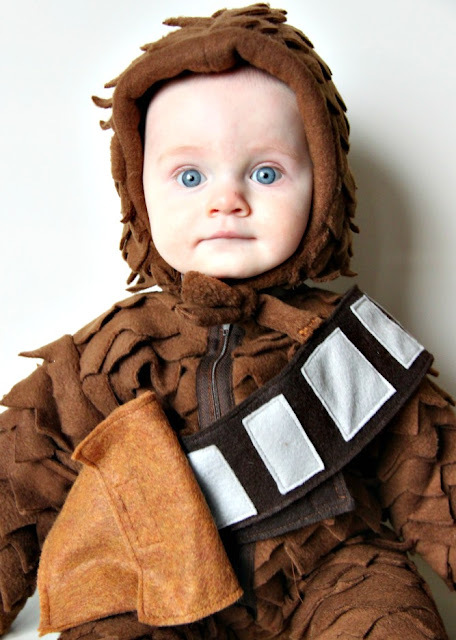 Baby Chewbacca. 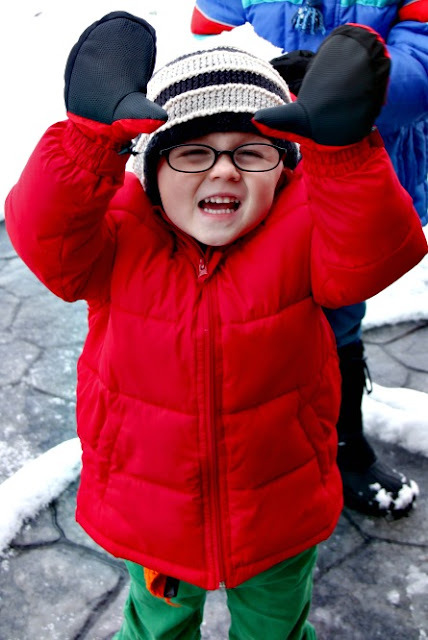 Are you kidding me with how cute he is?? 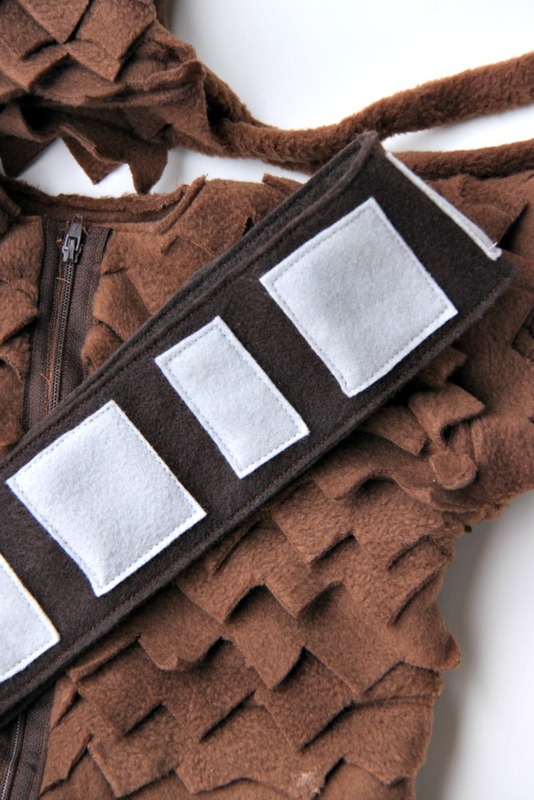 I knew this costume was going to take the most time, so I started my Halloween sewing parade with Baby Chewbacca. 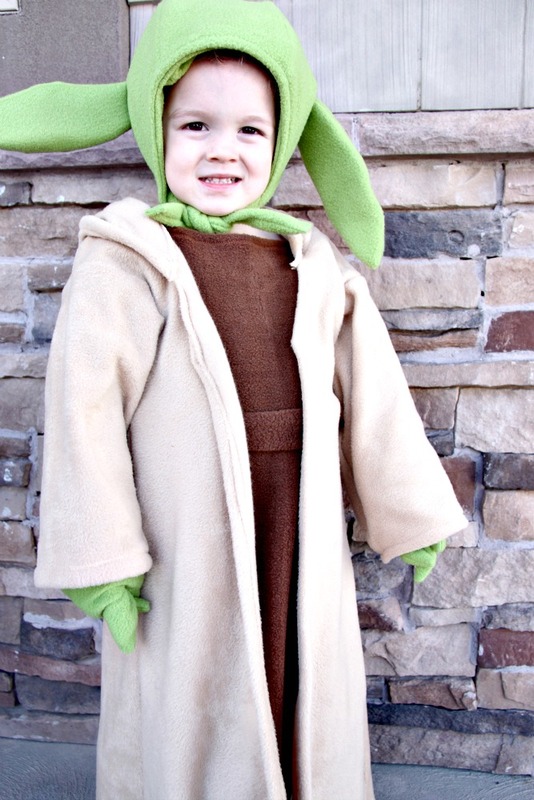 I made the costume out of fleece. I toyed with just leaving the fleece as is but I really wanted some kind of fur texture. So I cut strips of "fur" out of the fleece and sewed it on in rows. Instant fur. 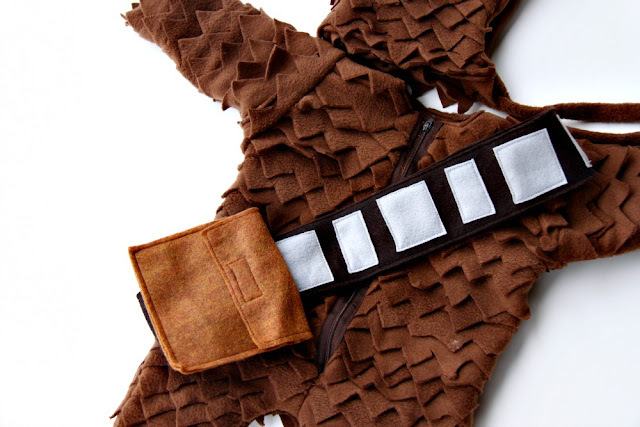 Chewie wouldn't be Chewie without his bullet pack sash thingy mabob and the tiny pouch...yup those are the technical names. I made the teeny tiny accessories out of felt. 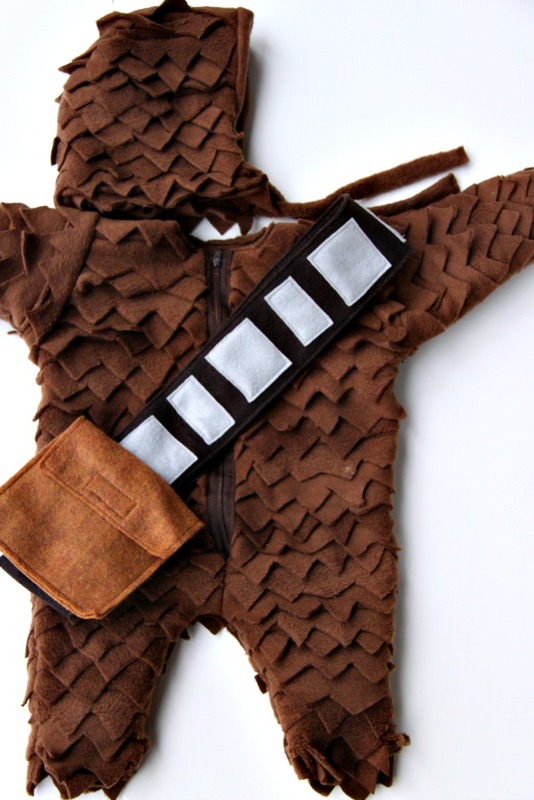 One Baby Chewbacca costume done. Woohoo. 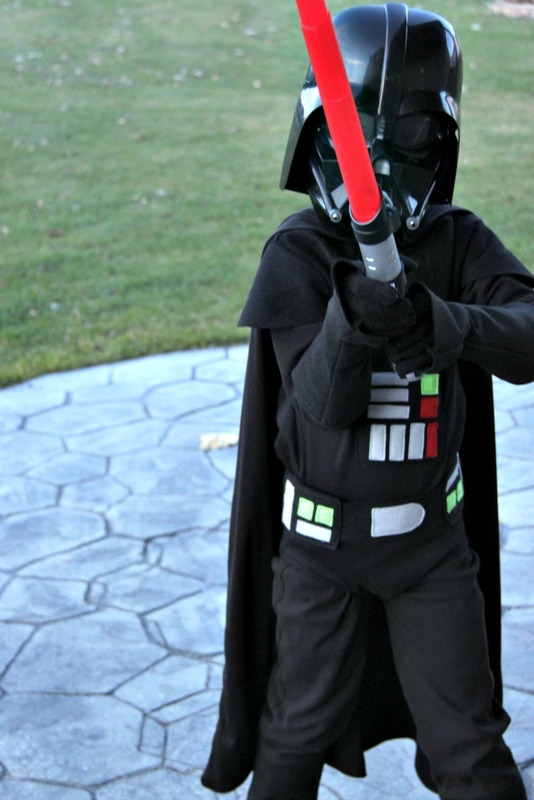 Now all I need to do is add our Yoda, Darth Vader, and Luke Skywalker and our Halloween will be complete. I think I can, I think I can. Hahaha. Stay tuned! We have had a crazy week. On the minor side of things, we have had some colds. Bean, Little, Dad, Mom and even Middle. Oldest was the only one who got out of the germfest. Needless to say not much has gotten done around here but hacking, coughing, wiping, whining (mostly me), and resting. Then on Wednesday to add insult to injury (oh wait to add injury to insult??? ), Hubby had a little mishap. While doing something manly and youthful, aka under no circumstance doing something like putting on one's socks while balancing on one foot), he threw out his back. He has never experienced this kind of injury before. We had no idea what to expect. After 45 minutes laying on his stomach on the floor in our closet, he moved to the bed where he remained the whole day. Day 2: He was able to hobble around with a make shift cane/umbrella and even sit on the couch. Woohoo major improvements! Day 3: And we are back to being an invalid. Day 4: WORSE! A trip to urgent care, meds prescribed, and more resting. Day 5: Not really better. However, today he is in a drug induced stupor. Day 6: Some PT and a long road ahead of us, but I am sure he will be back...ehem, to his normal self in no time. Over the last two weeks Little has had some crazy lazy eye action going on. It came on kind of suddenly. Needless to say we are a tad bit worried. Good news is we have a great referral for an doctor who specializes in this kind of thing AND we were blessed to get in super duper quick. 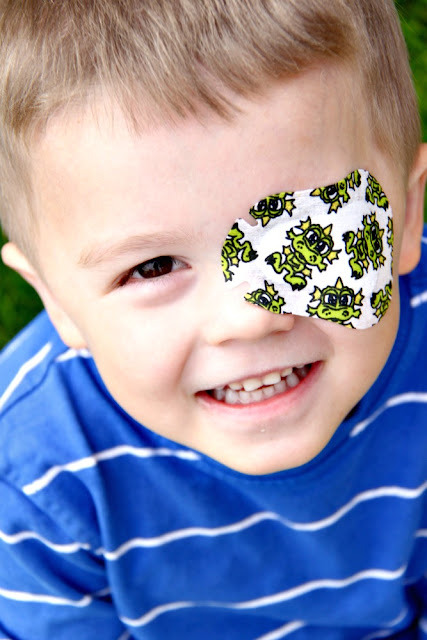 Until then we decided to pirate up Little. When I told "Pirate" to show Daddy his hook, he held up a little crooked thumb. Then when Hubby asked him where his booty was, Little very matter of factly stated, "Dad my booty is behind me!" Ahhh, love, love, love it. Needless to say, we are overwhelmed over here. Every day I start out with a great list of things that need to be done. Some regular things like cleaning the toilets and folding laundry. Then there are the fun yet necessary things like sewing Halloween costumes and planning a party for Middle. On top of all that are all the fun ideas that my brain just has randomly on a daily basis. Well by the end of that day, I am pretty sure all that is getting bumped out by resting, getting better, getting babies better, and taking care of Hubby. So I am sorry that things have been slow around the blog, but first I am a Momma and a wife and that has definitely been where my time and devotion have been practically 24/7. Thanks for understanding and hanging around anyway. 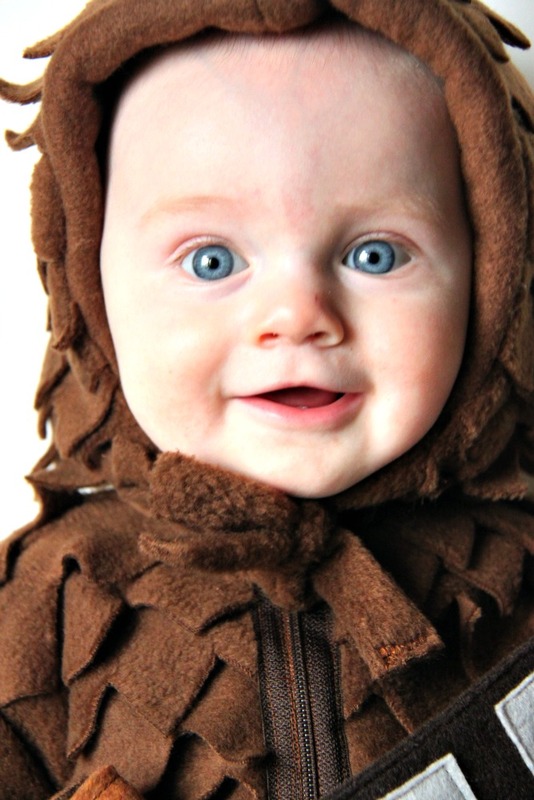 I promise I will try to have a couple things up soon...including a sweet costume debut of Bean. You are going to die for sure!!!! Thanks again guys! LOVE ya all. The other day I was at our local grocery store getting, well you guessed it, food. When what do my fall-loving eyes behold? A whole ginormous crate full of the most beautiful gourds ever. I hardly ever buy gourds to decorate with, but I simply could not pass them by. I am not kidding you when I say they are gorgeous. I gathered several white, blue, and bright orange squash. My sister was quite appalled that I would buy such lovely squash with only the intent of decorating. She kind of thinks squash-eating is dreamy. Still, much to her horror, I got home with my gourds and displayed them around the house...some on the mantle which is still on my blog-to-show-you list. These gourds reminded me that I have yet to purchase pumpkins for the family. I am pretty horrible at this Halloween tradition. Cutting, gutting, and carving pumpkins is not my favorite thing to do. However, Hubby and the Little Men really enjoy all the mess and weilding of knives. So we get them. So I guess I had better get some soon. I prefer my pumpkin in food form. Yup the food is going to win every time. With that little insight into my pumpkin preferences, you will not be surprised that in that same shopping trip I passed the display of canned pumpkin and grabbed a couple of cans to add to the couple of cans I already have in my pantry. It is Fall after all. A girl can never have too much canned pumpkin. As I was trying to drown out the loud misbehaving of my children typical for a grocery store outing, I was day dreaming about what to do with my new canned pumpkin. These bars were almost an instant creation in my head. I figured how could I go wrong by combining several of my favorite things into one bar. Then I simply had to put all of the wonder components together. A gloriously Fall and utterly scrumptious treat was born. 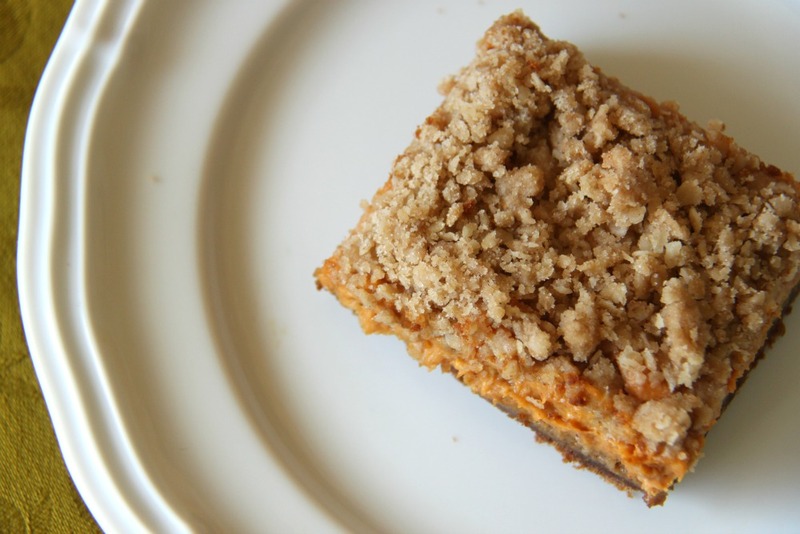 A gingersnap crust gives these bars just the right amount of crisp and chewy. Then you have a creamy pumpkin pie inspired cheesecake layer. Oh then the streusel. Well how can you go wrong topping something with an oatmeal, brown sugar, and butter crumble? You can't friends. You just can't. Well before you keel over, be sure to make yourself some of these and enjoy. Prepare crust first. 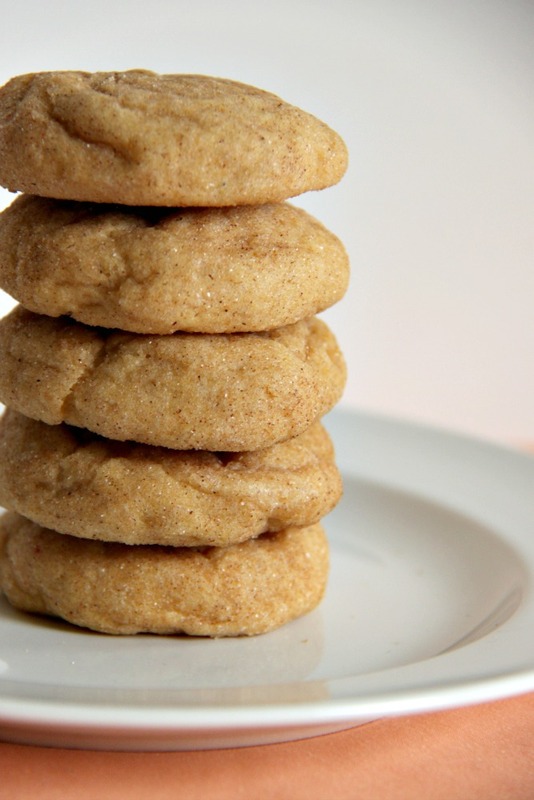 This is basically a ginger cookie dough that I use for my favorite gingersnap cookies. To make, first cream shortening and sugar. Then add egg and molasses. Combine dry ingredients in a separate bowl. Then slowly combine dry and wet ingredients until well combined. Press the dough into a lightly greased 9x13 pan. Set aside. To make the filling, combine all of the ingredients and mix until well combined. Pour over the cookie dough already pressed into the pan. To make the streusel topping, combine all of the ingredients either in a food processor or a bowl. If you mix with a food processor, pulse until the butter is fully incorporated and you have a crumb mixer. Without a processor, wash your hands, roll up your sleeves and get in there and combine everything with your own hands. Sprinkle the topping evenly over the filling. Bake for 35-40 minutes. Until the center is just set. Make sure to not cook too long so that you don't over cook the crust/cookie layer. Let cool on the counter completely. Then refrigerate for at least two hours. Tootsie Pops: How Many Licks?